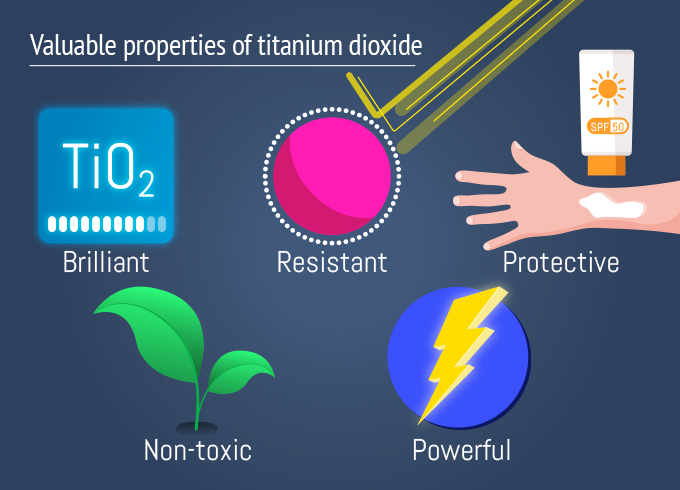 What is titanium dioxide and where is it found? Titanium dioxide (TiO2) is a bright, white substance; a versatile pigment used around the world. It has many valuable qualities that make it an extremely useful and important ingredient for use across a variety of industries. TiO2 is most well known for giving a bright, white, appearance to whatever it is applied to. It is used in white paint and as the base for many other paint colours; it is also found in cosmetics and food to give a highly opaque, bright appearance. 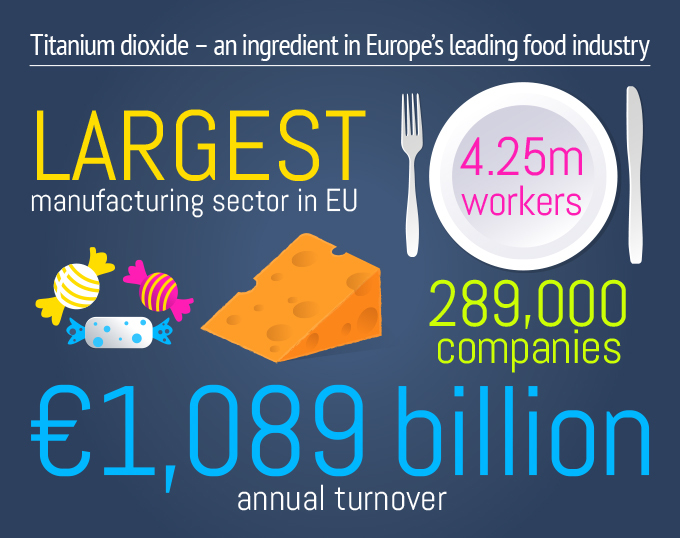 From its extraction and production, all the way to its application across various industries and in commercial and home use, titanium dioxide provides a huge number of economic benefits for the people of Europe. 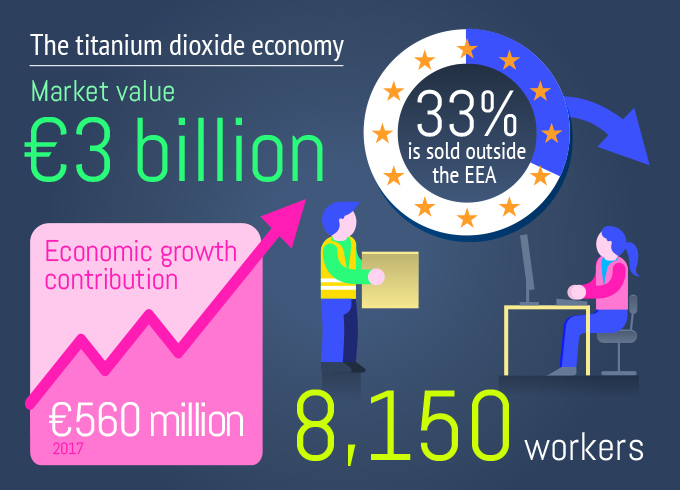 The EU provides 20 percent of global titanium dioxide production – an estimated market value of €3 billion. Of this, around 68 percent is sold in the European Economic Area. 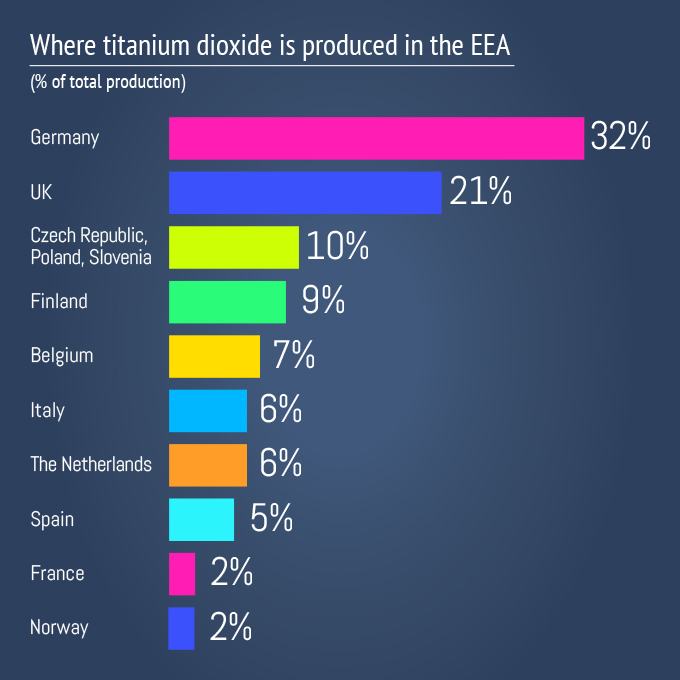 Titanium dioxide is manufactured in 18 plants in the European Economic Area (EEA). 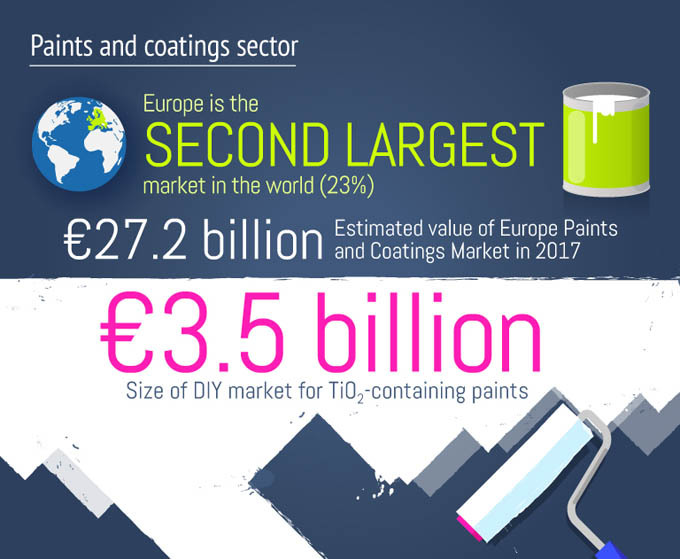 Paints and coatings, commercial printing inks, plastics and paper make up 94 percent of the total demand for TiO2 in the EU. As a white pigment, TiO2 is one of the most important raw materials for paints and coatings. 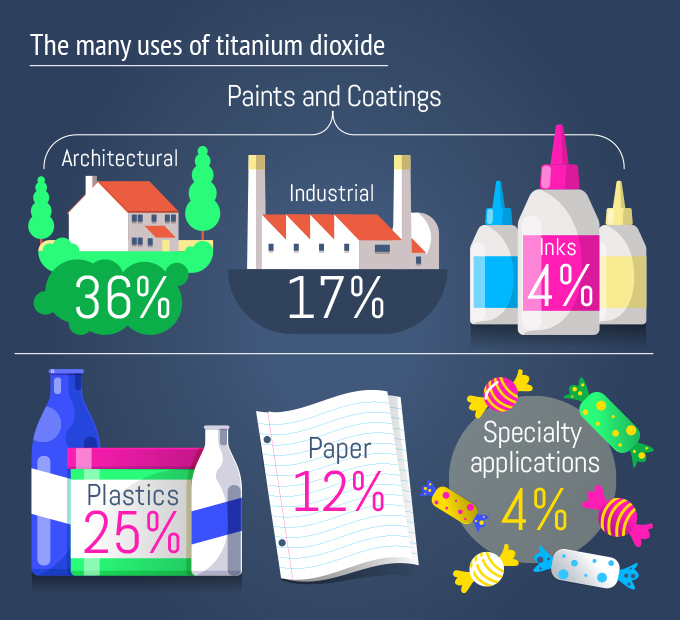 Titanium dioxide is found in wall paints, façade coatings, wood and trim coatings, including emulsion paint, lacquer, wood stain and roof coatings. 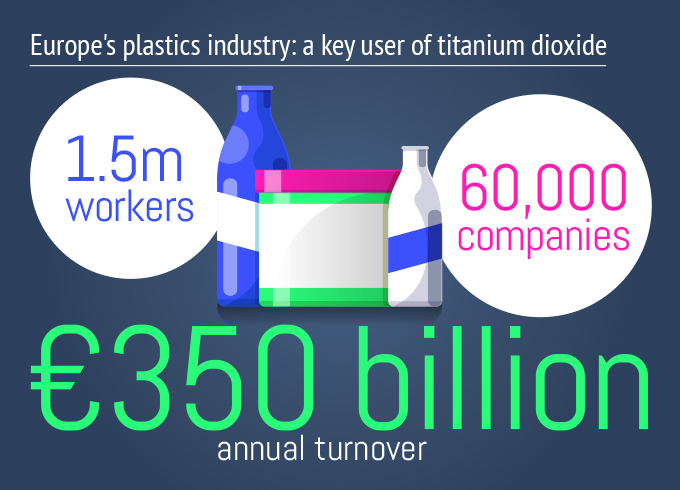 In the plastics industry, the main uses for TiO2 are in packaging, building, construction, transport, marine, clothing and sporting goods. The overall value of these sectors, including downstream markets, is €650 billion. 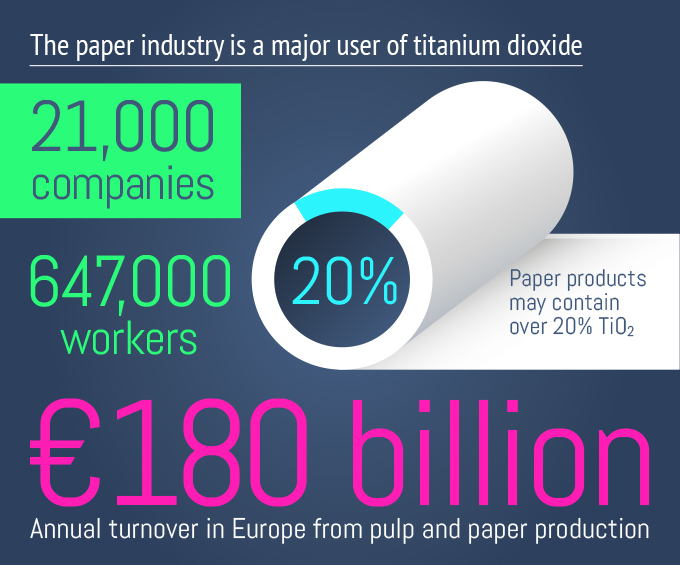 Main uses for titanium dioxide are in decorative paper, wallpapers and packaging. The levels of TiO2 in décor paper can be between 20-40 percent, in wallpaper TiO2 levels are between 1-10 percent. Known as E171, titanium dioxide is used in confectionary (including ice cream and chocolate), milk substitutes/whiteners, soups, cheeses, sauces, spreads, flavoured drinks, nuts and desserts. 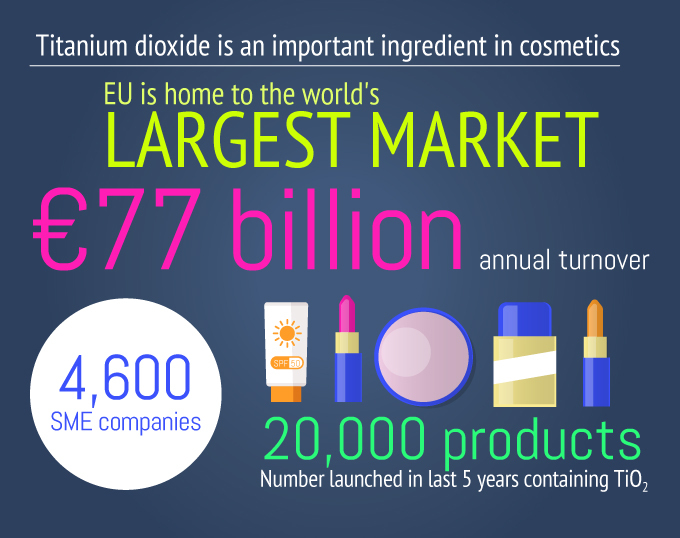 Over 20,000 cosmetic products have been launched in the last five years containing TiO2. Intolerance or allergy to titanium dioxide is very rare, and it is often used for the protection it provides from harmful UV rays. TiO2 is approved as safe for use by the Scientific Committee on Consumer Safety, when used in a concentration of up to 25 percent, and not in spray applications.